It’s July 4th and it’s raining steadily and is about 45 degrees. We’ve had a free travel weekend, turned in term papers and taken final exams in the past 5 days. Look at your favorite student’s Facebook page to learn more about their free travel weekend. Today is our second-to-last day in Montevideo and the final day of shadowing at Escuela Roosevelt and Hospital de Clinicas. We took gifts of thanks to our hosts at each location with carefully written letters. (It’s surprising how long it can take to hand write a letter in a language that’s not your first language…even if someone else does all the translating for you!) This has been an excellent opportunity for our students. You will see more photos from the Escuela Roosevelt because they have signed releases to allow photos of their students. At the hospital we are very careful not to violate any patient’s privacy, so we have taken only a few photos with the physicians and professors who have been so gracious and allowed our students to follow them on their rounds and or observe surgeries. It’s interesting because each of the physicians asked us to please email a copy of the photographs we took. 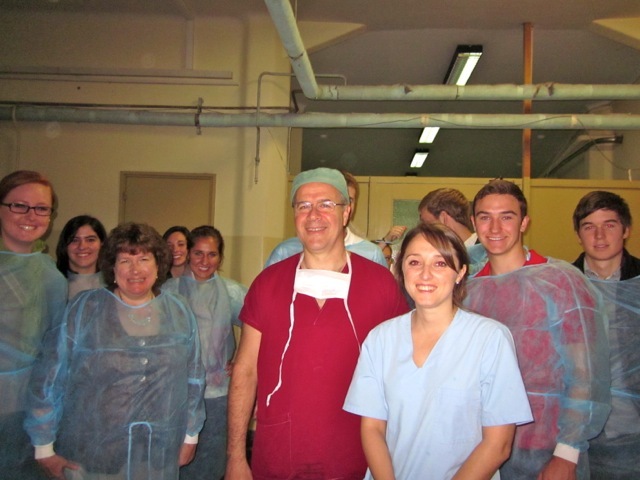 They seem to have enjoyed having our students and teaching them a little about the practice of medicine in the Uruguay. Our students have observed discussions of complicated cases, insertion of stints and other heart procedures, patient evaluations, patients being bathed and cared for in other ways. We are very impressed with the personal concern shown by Uruguayan physicians and nurses who know their patients well and place high value on strong relationships between patient and professional staff. 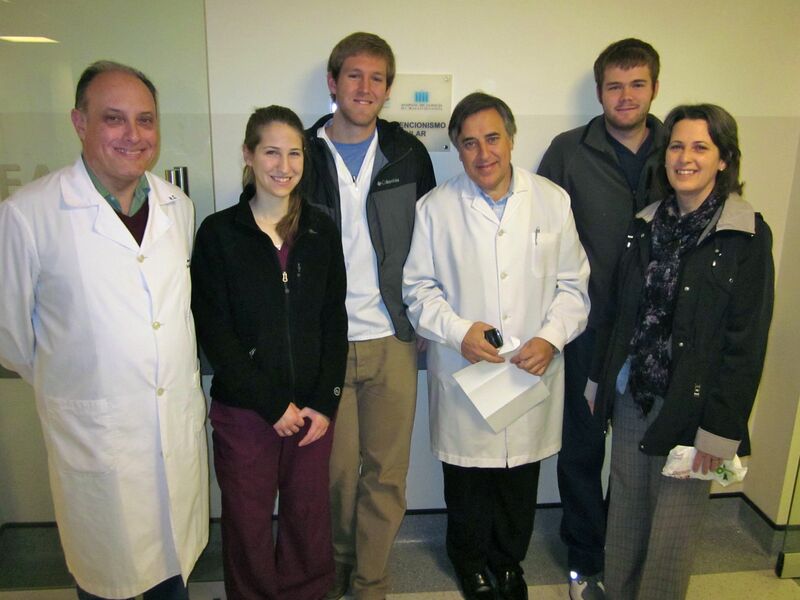 Students with Dr. Sosa, Dr. Perazza and Dr. Powell on the Internal Medicine floor. 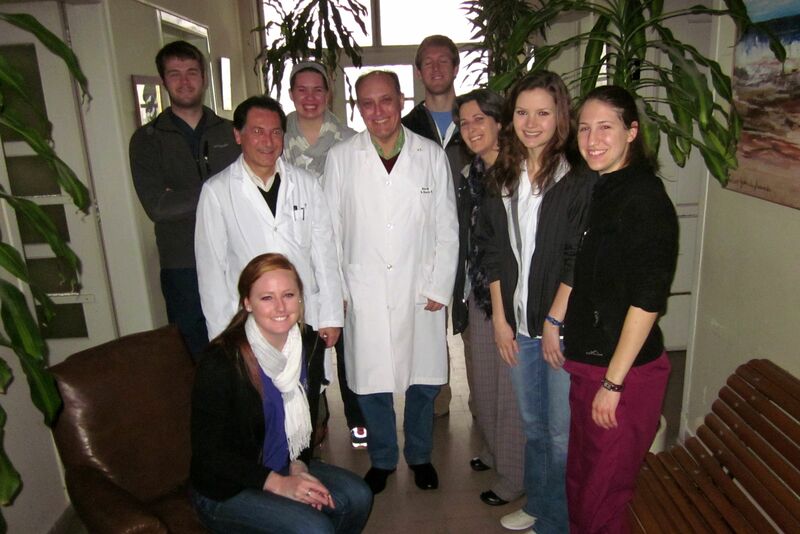 Dr. Perazza and the Professor of Cardiology with three students and Dr. Powell. 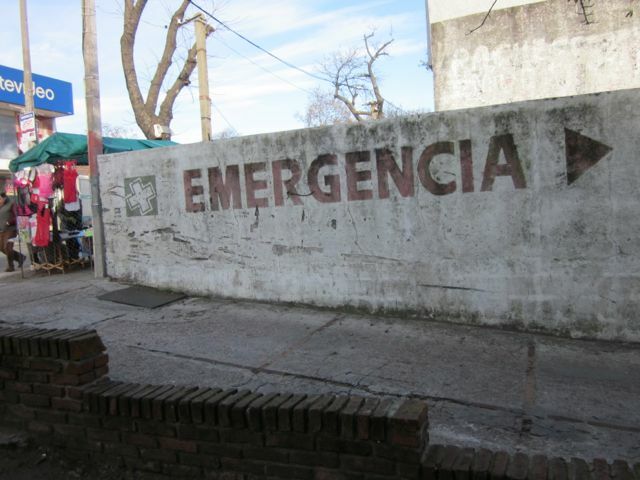 I’ve asked each of the students to post a comment after this post that is a reflection on what they’ve observed and learned about the influence of culture on the practice of medicine in Uruguay. We are grateful to have had this experience and will miss the students and faculty who have become our Casa ACU family. The past week has been a period of intense class work and study! 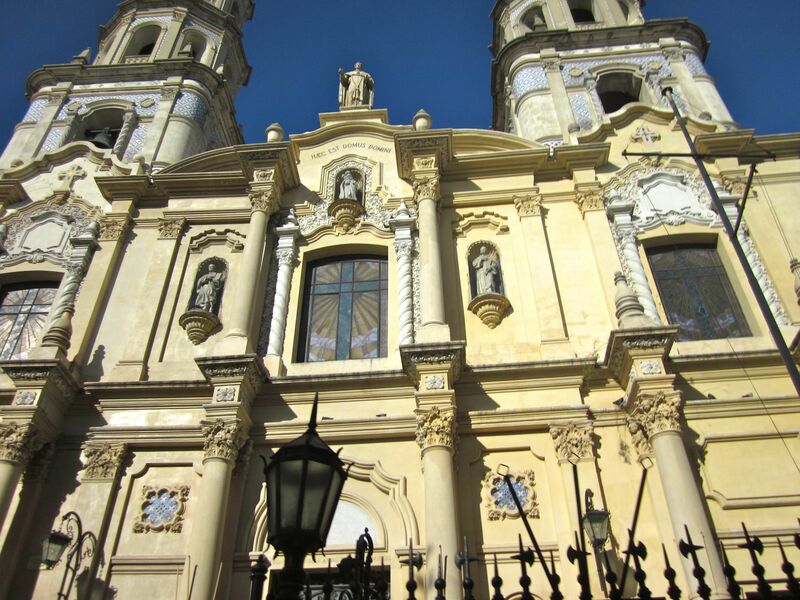 In seven weeks the students earn 6 hours of course credit, learn a little Spanish supported by daily conversational Spanish labs, and engage in shadowing at schools and hospitals as well as visit many locations of historical and cultural interest. All this in a foreign country where they have to learn how to find food in “supermarcados” and cook it on a large gas range, negotiate small blue bags of laundry back and forth from the “lavadero” and jump on and off of crowded city buses quickly so that they don’t get left behind. (I wish I had a few pictures of the looks on some unnamed faces when the bus pulled away and they weren’t on it or off of it as planned!) It’s been a very full seven weeks! The week started well with a trip out to Raquel’s house to worship with the house church that was meeting in her home. It’s about an hour ride outside of Montevideo and we took food to contribute to a potluck lunch with the church members. It was wonderful to be with Christians with whom we share so much even if our language isn’t one of the things we share…the love among the group is obvious. And since we all know and love Raquel it was a special treat to be able to visit in her home. After lunch we walked to the beach very near her home. The day was sunny and reasonably warm and it was a great day to walk along the beach…some took off their shoes and waded in the water…or drew pictures in the sand. 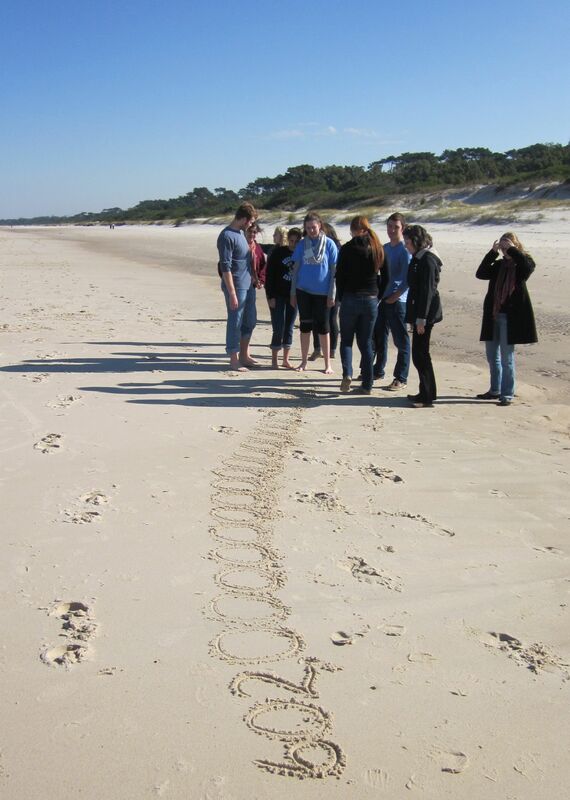 Check out Avogadro’s number in the sand of the Montevideo “playa”! The rest of this week we’ve studied and today we finished our formal class meetings, except for final exams, which will be next Monday and Tuesday. This has been a very interesting week to be completing a course on Global Healthcare. We’ve been talking about different systems of healthcare delivery and issues like an individual mandate, the role of insurance companies, whether provision of healthcare is a human right, priorities in the practice of medicine, and of course how culture affects how we approach all of these issues…and today an hour before our final meeting came the long awaited supreme court decision! It’s been remarkable to walk around Casa ACU and hear students in long discussions about how healthcare can and should be provided hours after class has ended. I have really enjoyed having students with a variety of interests be part of this study abroad group…the business major’s perspective is so different than the pre-med student’s and the SLT students are more involved in the education process and bring another viewpoint. I think we’ve really learned from one another! Also, in addition to our regular shadowing activities we’ve made a few additional visits. 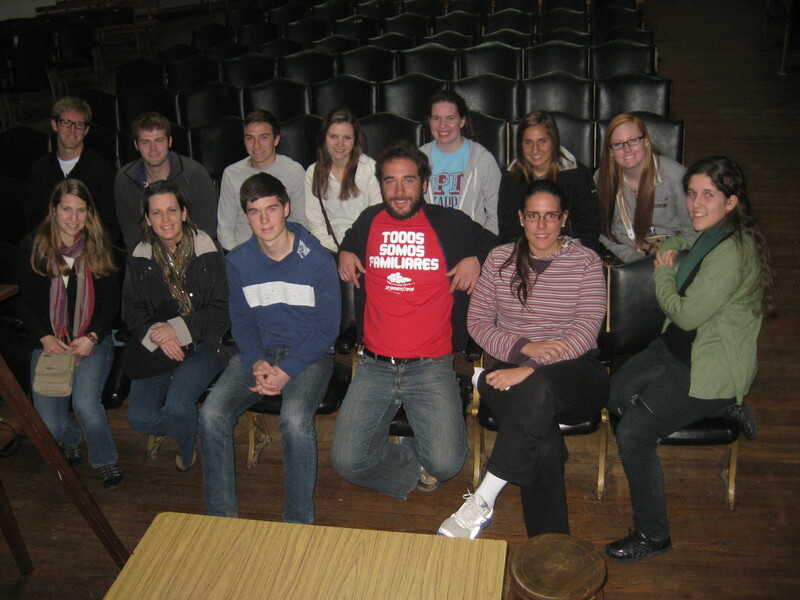 The SLT students visited the Hospital de Ninos Perreira Rossel and the other pre-health students visited the only public medical school in Uruguay. 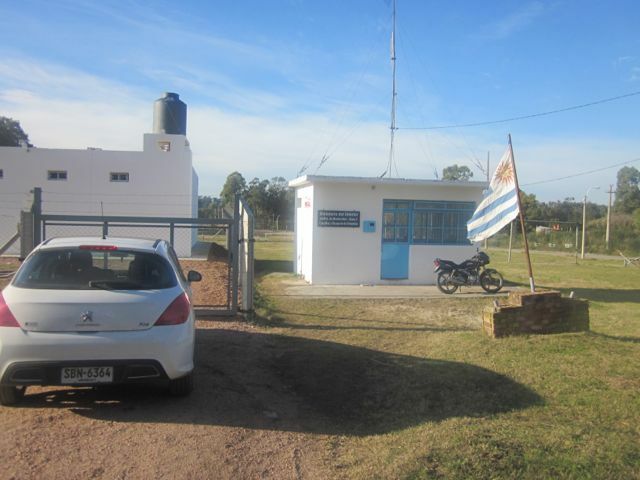 Until 2006, it was the only medical school, until the opening of a small private medical school in northern Uruguay. Our guides at the medical school were current medical students and we were visiting on mid-term day and this meant there was a lot of activity and noise all over the campus! 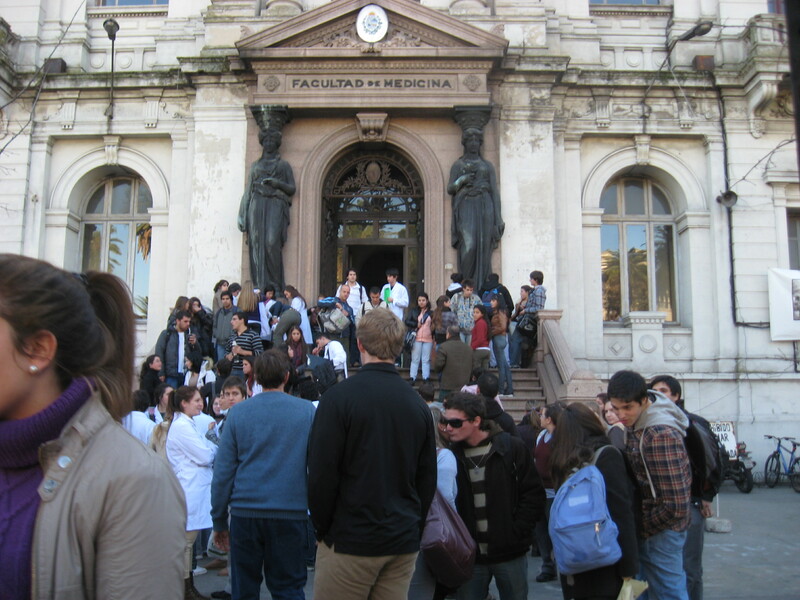 Medical school is free in Uruguay (as is all university education). About 1200 students begin the program every year. There are no entrance requirements beyond the equivalent of high school graduation with plenty of coursework in the sciences. The high school science programs, however, are very demanding. Of the 1200 who begin medical school each year, only 400 will graduate within 7-9 years. The time frame varies because most students must work while attending school. We learned so much, but probably most remarkable is the level of involvement that the students have in governance of the medical school’s administration and even curriculum. A board of students, faculty, and alumni set the standards for all aspects of the medical school including such things as a recent request to the national government for a change in funding structure. This organization certainly gives the students a sense of ownership! The anatomy lab wasn’t open, but we could see cadavers under sheets on tables. 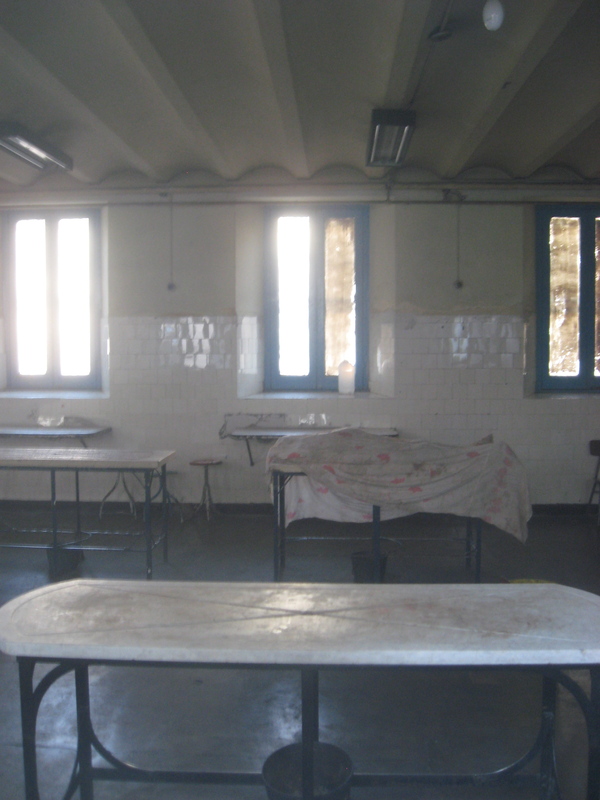 Each cadaver is used by about 25 medical students. 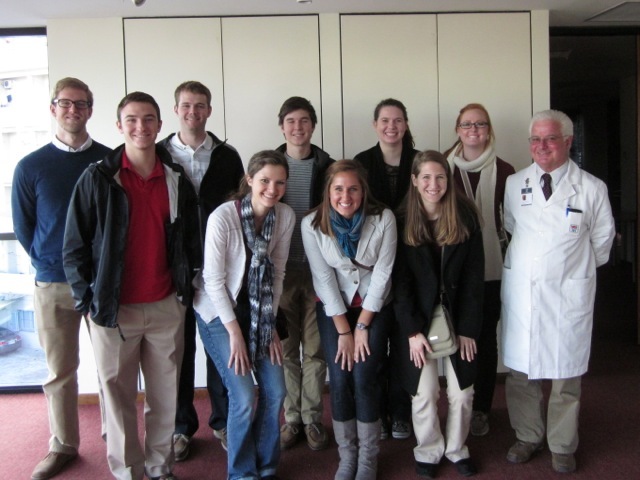 ACU students with our student hosts in the large lecture hall at the med school. This weekend is “free travel” weekend and we’re all getting a few days to explore. We have no classes tomorrow and many are leaving for the weekend. It’ll be a weekend of rest and one last chance to see a few things in the country that has been our temporary home for most of the summer. 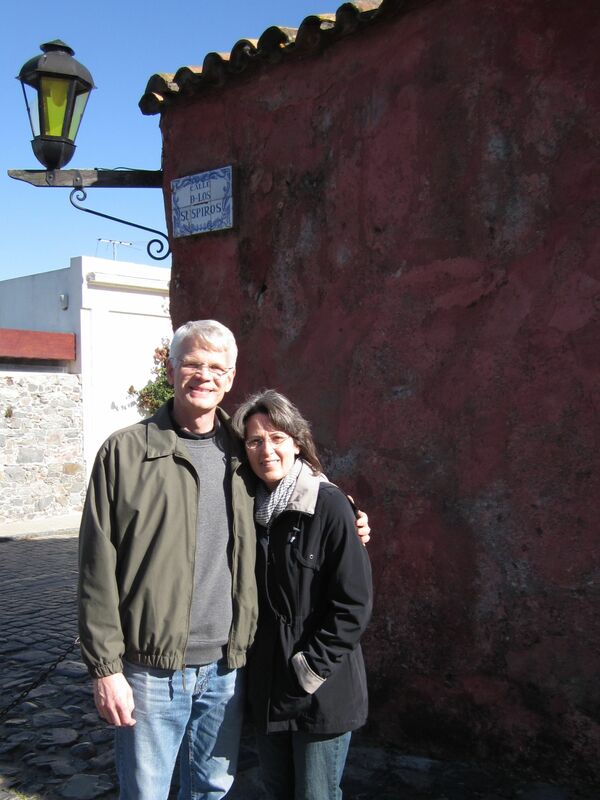 We look forward to coming home, but will miss the warm greeting and the many kisses on the cheek that have become part of our habit while in Uruguay. Reminds us that maybe we should slow down just a little bit! It’s been a while since I’ve posted an update….we’ve been busy! We had a two and half day “break” between major trips…and spent this time working very hard on coursework and observation. (6/12-6/14) As we near the end of courses, major papers and projects are due and the house is surprisingly quiet as students focus on these tasks. It’s not unusual to see most of our students sitting on couches and bean bag chairs in a semi-circle in the Casa loft area…all silently staring at computer screens or reading books illuminated by the soft orange glow of space heaters! 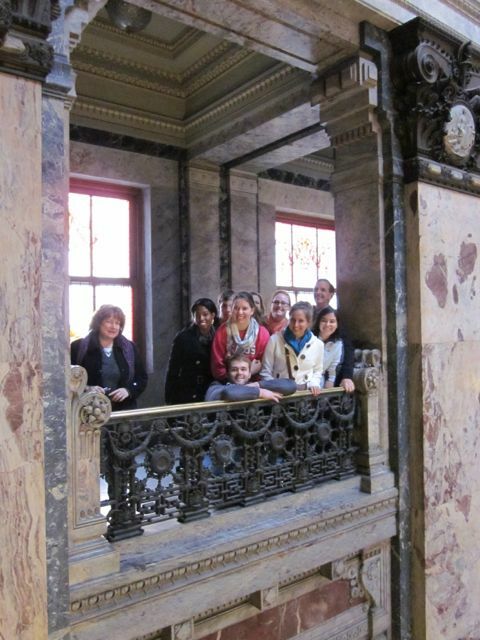 While there’s a lot to see and do here, we are STUDYING abroad! I will ask two of our students to post a reply to this installment that describes a unique experience they had during our regular shadowing time on Wednesday morning 6/13. Emily and Josh are both leaning toward careers that may involve health care management. 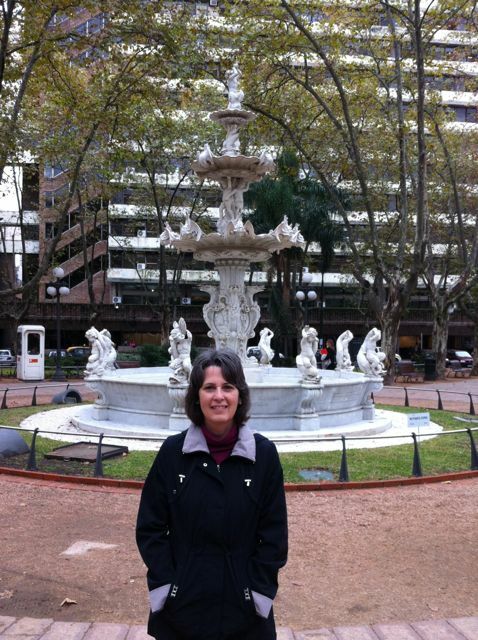 The Walker’s were able to set up an appointment for them with the main office of Johnson and Johnson in Uruguay and they met with the director of this office. Both reported that it was a very interesting meeting and it was fun to see their enthusiasm for business and the possibilities of making a difference in the world through working in business. 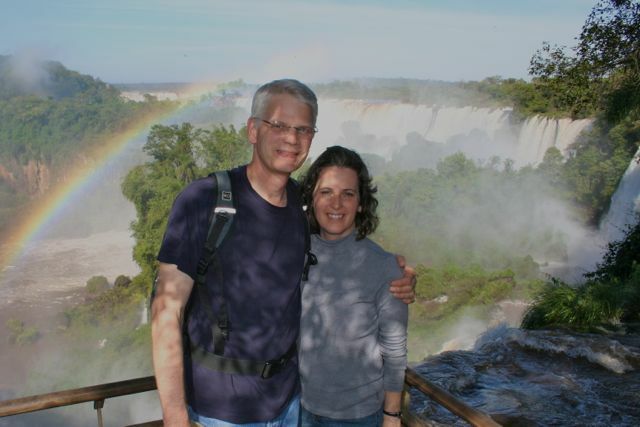 On 6/14 we left Montevideo to fly to Iguacu Falls. 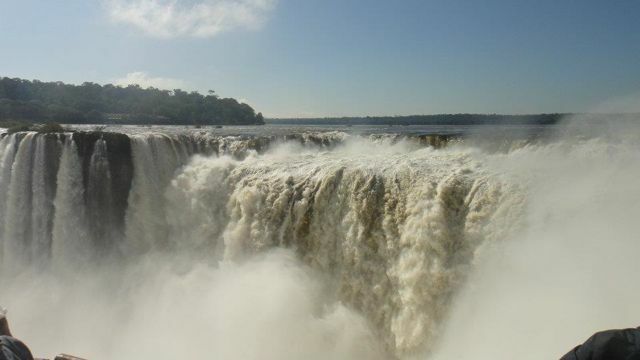 The falls are located on the border of Brazil and Argentina, very near Paraguay. For students “collecting” countries, we actually were in all three countries during our trip! It is difficult to describe the beauty of the falls. The volume of water and width of the falls are breathtaking. 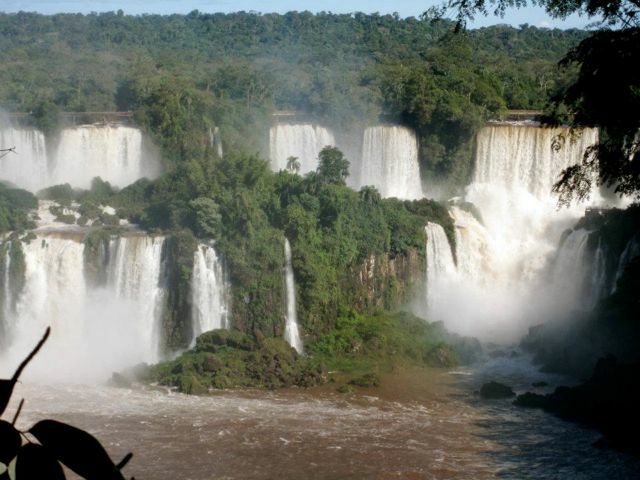 There are about 275 separate falls in the group collectively named Iguacu Falls. 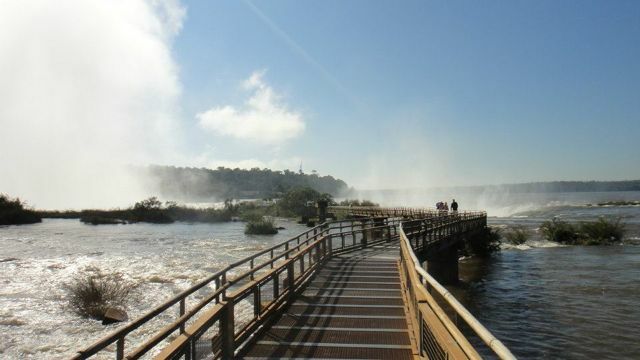 It has been named one of the seven natural wonders in the world. Pictures never can communicate the experience, but see several below. The experience is more remarkable because of the catwalks that have been built very close to several of the largest cataracts. You can feel the power of the rushing water, spray in your face…the beauty is overwhelming. I think that I could be a park ranger in this park and never grow tired of seeing these sights every day and watching the way the waters change through seasons. So here’s a catalog of how we spent our time in Iguacu or Iguazu or Iguassu (depending on which language you’re reading in!). 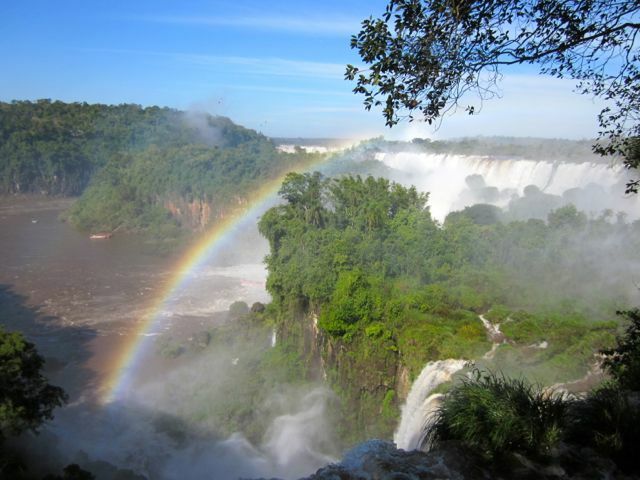 6/14 We arrive in Foz do Iguazu, Brazil and checked in to our hotel. 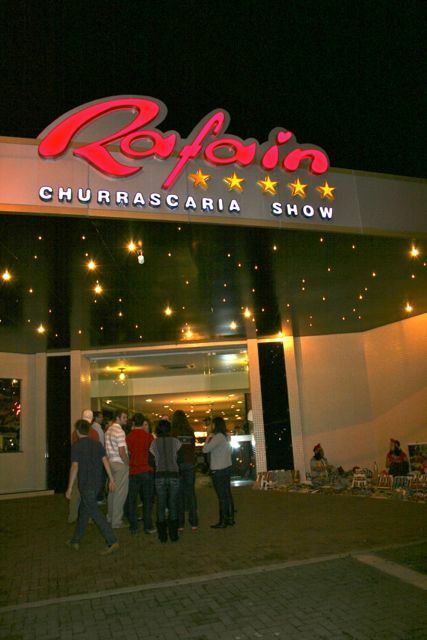 That evening we attended a music show showcasing the music of all of Latin America at the Rafain. 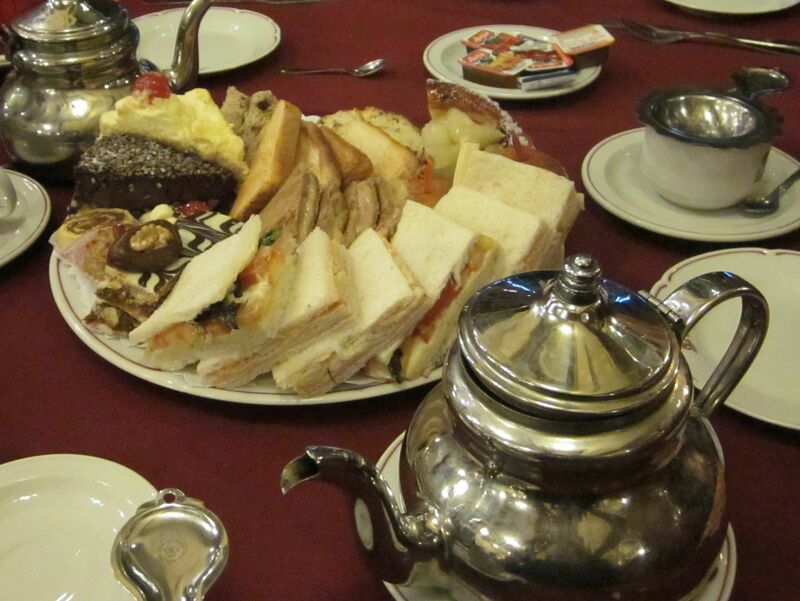 The show admission includes a lavish buffet….and we all enjoyed the dinner and spectacle! 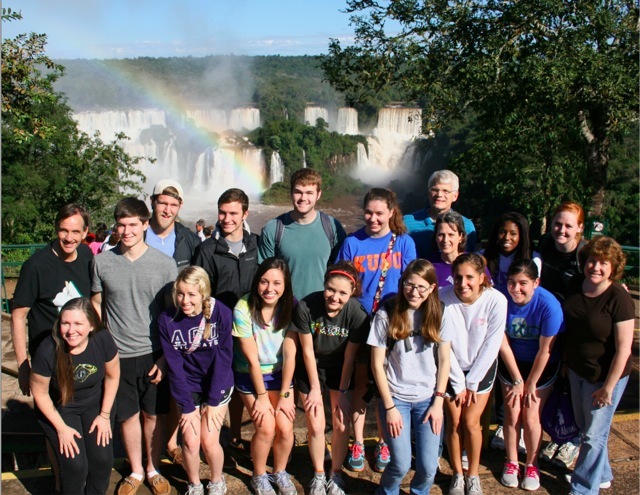 6/15 We toured the Argentine side of the falls. This was our first sight of the falls and it is breathtaking. You walk across a catwalk over water rushing toward the largest fall…the “Throat of the Devil.” What seems truly unique about this is that the falls have been formed because of two intersecting canyons that differ in depths…so you walk along what seems to be a perfectly flat landscape and suddenly out of nowhere an enormous hole appears and all of the water disappears over the edge of the hole. As you get nearer to the falls you see the magnitude of the fall you are standing over and are confronted with the power of the creator. If you’ve never met a coati these rodents of unusual size are very aggressive food scavengers who will attack the unsuspecting consumer, even jumping on tables and laps in large numbers and attempting to enter backpacks when food might be stored. 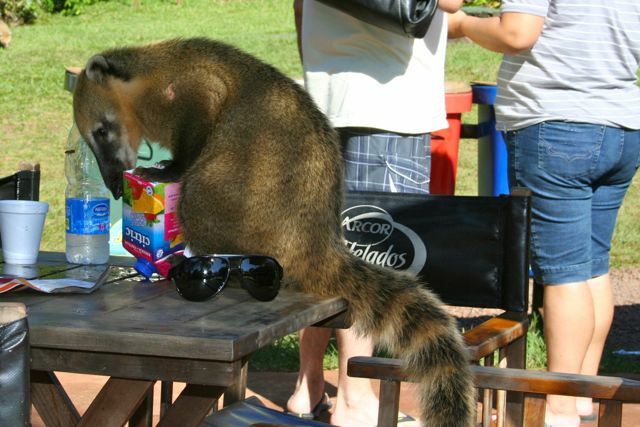 Coatis are abundant in Iguacu. There seem to be fulltime employees whose only job is loud hissing and clapping while chasing coatis with bamboo brooms out of food service areas. 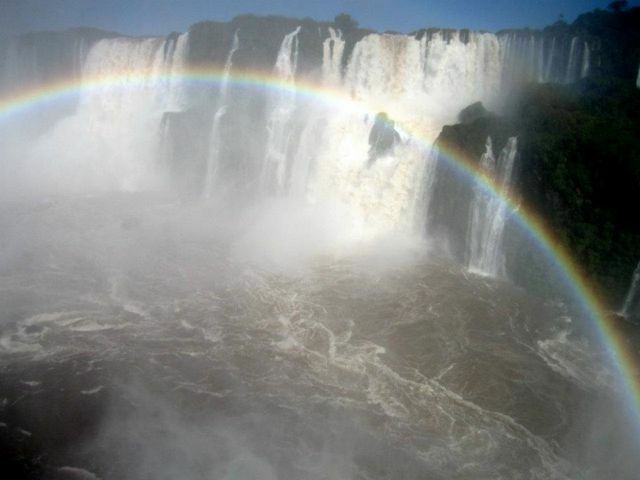 6/16 The Brazilian side of the falls is a new experience. From this side of the river you can see the full width of the falls. As you walk along a 1.5 kilometer path, each opening in the trees reveals a new view. We probably took 500 photos of waterfalls and rainbows. Thank goodness for digital cameras! The final walkway on this path takes you by the foot of one enormous as the waters flow into another large drop. It’s wet and deafening to stand near the thundering water and once again is awe inspiring and humbling to realize how small we are. 6/17 On our last day in Iguacu we toured the Itaipu Hydroelectric Plant. 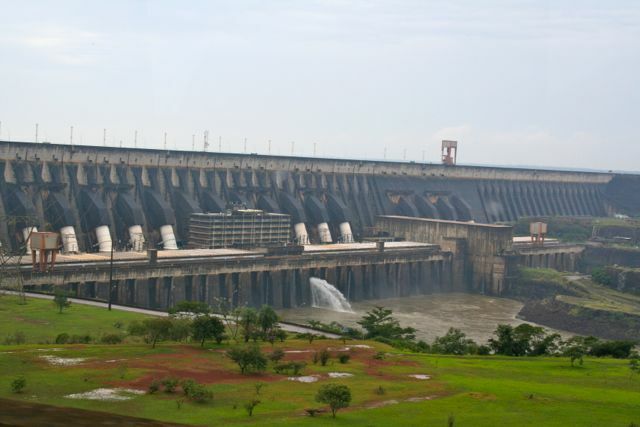 This structure on the Perana River supplies 90% of Paraguay’s electric power and 20% of Brazil’s. It is produces more electricity than any other hydroelectric plant in the world. Though not nearly as beautiful as the falls, it was very impressive. 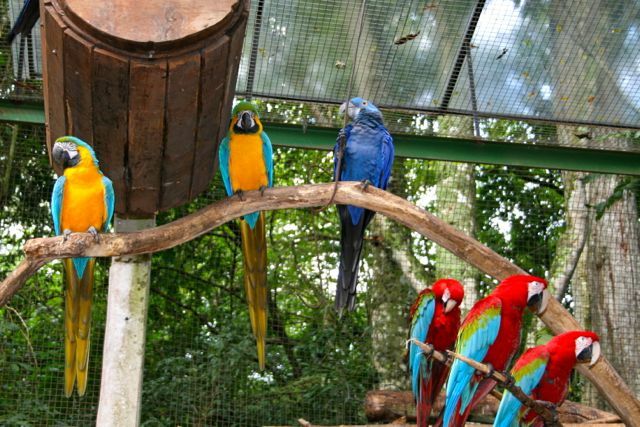 During the afternoon we went to a Bird Park with many endangered and rehabilitating South American birds….colorful, interesting, and startling at times when large parrots swoop down overhead or a tucan sidles up next to you on a railing. The weather cooperated and though it was a little drizzly, the birds were still active and interactive! 6/18-6/19 Back to the books! 6/20 Shadowing in the morning at Hospital de Clinicas and Escuela Roosevelt. The routine has been good. 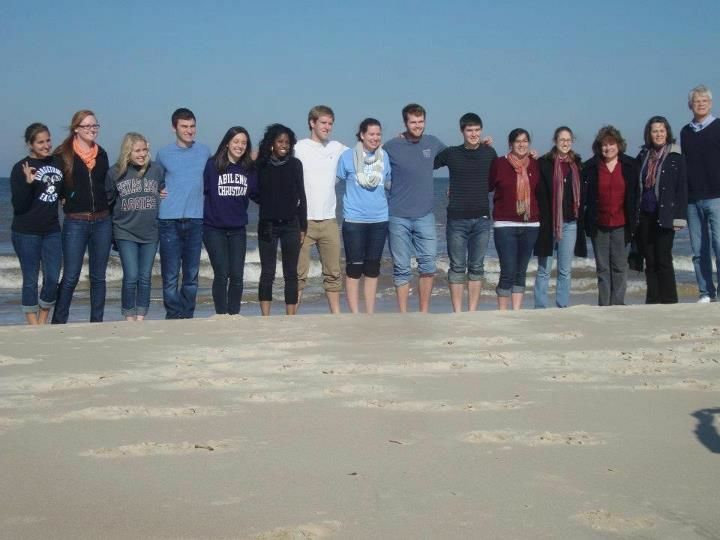 Our students are getting to know their surroundings and the physicians and teachers that they work with each week. At the hospital the students have seen patients and surgeries and meeting among staff members. They’ve observed the slower pace of medical practice and the resulting stronger bond formed between patients and health providers. 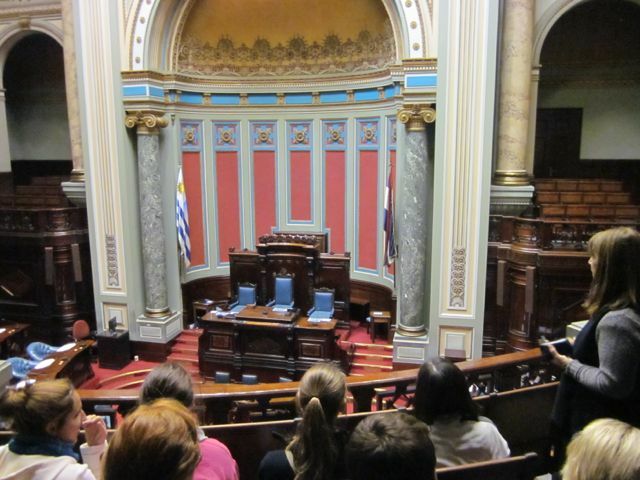 During the afternoon we visited the Legislative Palace. 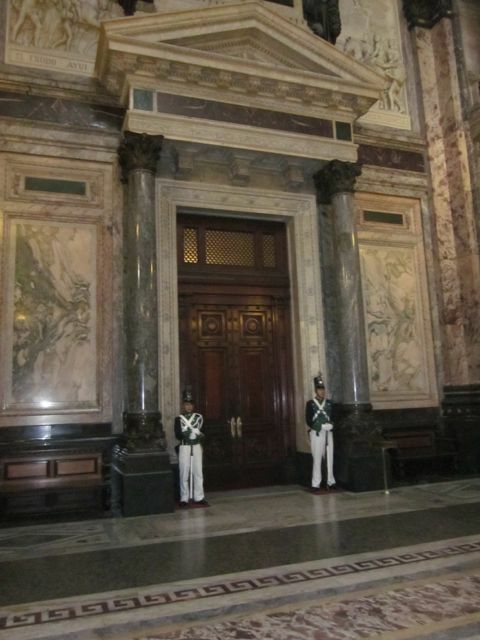 This remarkable building is the home of the governing bodies of Uruguay and is elaborately decorated in many different colors of marble all mined in Uruguay! 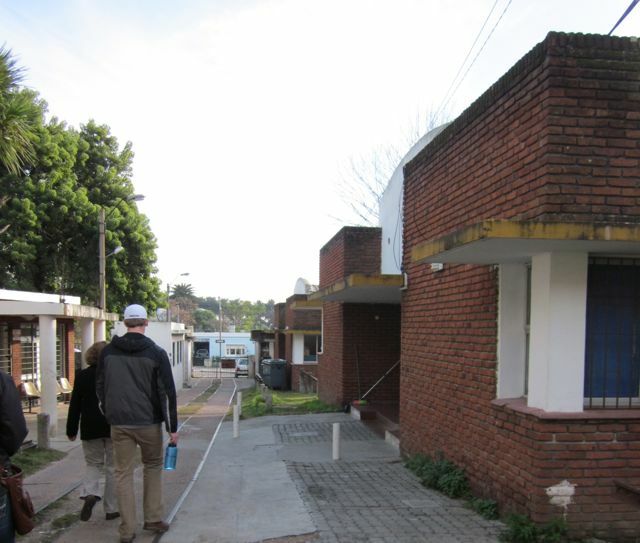 6/21 This morning we visited the primary Cerro clinic and then one satellite clinic. This simple facility serves a community of over 200,000 people, though only 77,000 use its services. The rest of the community members are members of either a mutualista (an HMO type insurance plan) or buy a private insurance plan. The investment in community-based clinics staffed partially by volunteers is remarkable. 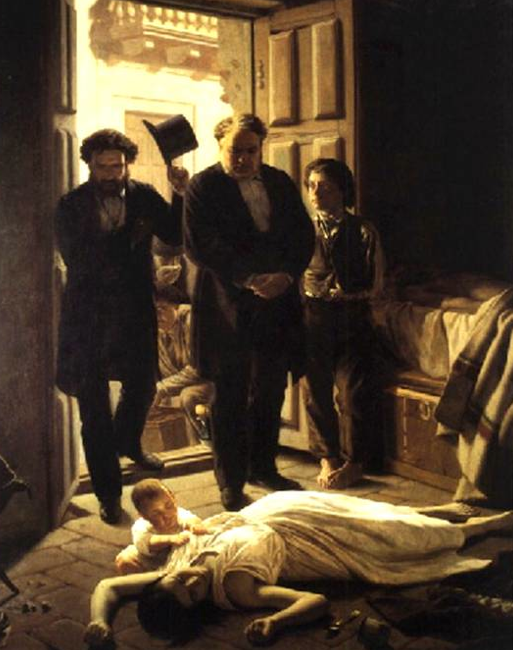 The influence of libertarian theology on the approach to providing healthcare is evident even in this secular society. 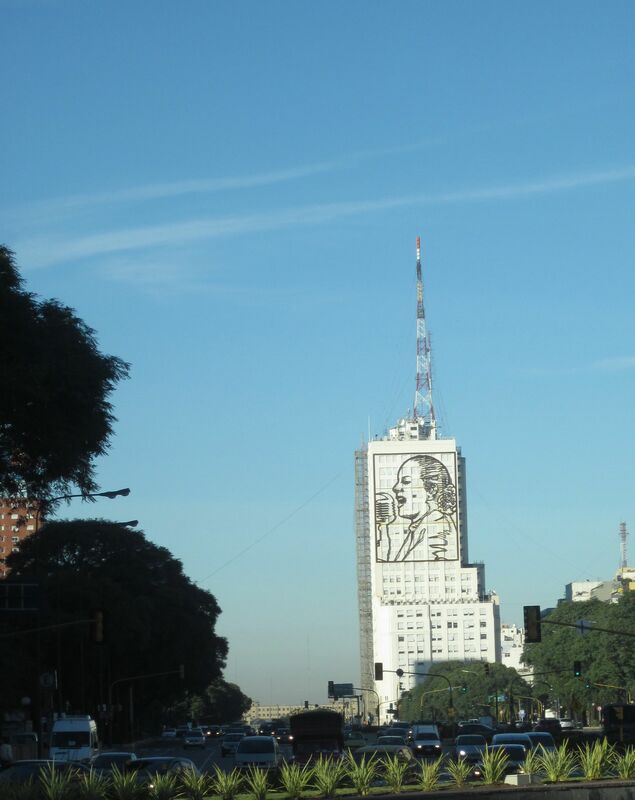 We have two more weeks in Montevideo. We are loving our experiences here and are all learning more about ourselves and our host culture and more about Global Healthcare. We’ve had some wonderful opportunities to observe/interact with Speech-language pathology professionals and clients in Montevideo, both at the large children’s hospital down the street from us, and at the Roosevelt school. We were warmly welcomed at the hospital by the director of speech pathology, who is also the head of the training program in Fonoaudiologia at the Universidad de la Republica. On that visit we shadowed various SLPs and students as they treated infants and young children for feeding and swallowing problems (pediatric dysphagia), language difficulties, and cleft palate. We were really struck by the tremendous skill and professionalism demonstrated in the midst of limited resources and space. Hopefully, we’ll get to return once more at least before heading for home! At the Roosevelt school, each of the 4 Communication Sciences and Disorders students has been able to help as a teacher’s aide in a classroom. This school, founded 70 years ago, exist to serve the needs of children with severe motor impairments. Most of the students are impacted by cerebral palsy, and many have concomitant communication, feeding, and cognitive difficulties. Right now the school is without speech-language pathology services, and the teachers have certainly made us feel that we are useful helpers! My students (Alaina Wolf, Denysha Taylor, Kelsey Roberts, and Trina Knight) are developing relationships with students and teachers, and working to support the communication attempts of at least one student in each class. Some of them are creating basic communication boards that will be left behind for the use of specific non-verbal students. 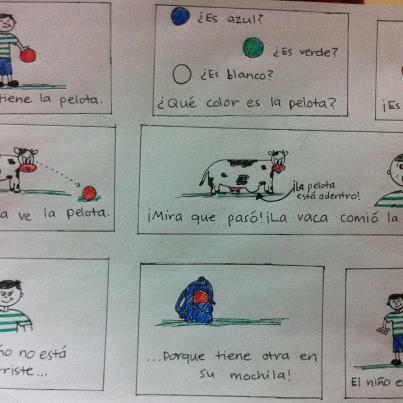 Others are creating language materials that can be shared and utilized with several children. One student is working with me and the teacher to develop communication skills in a child who has symptoms congruent with autism spectrum disorder. We’ve learned that, as in the US, there is a HUGE need for SLPs here, and we all feel affirmed in our career choices! 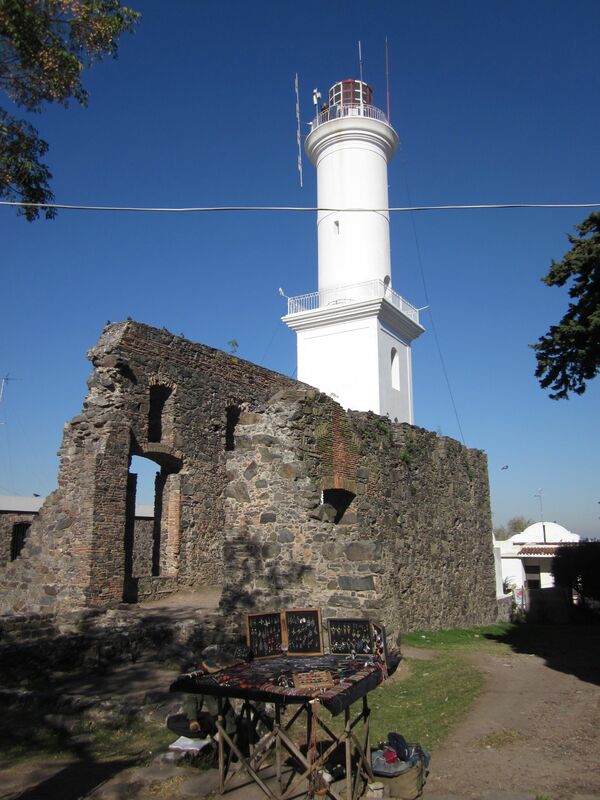 On Friday, June 8th we left our “home” in Montevideo, Uruguay to travel to the big city of Buenos Aires, Argentina via Colonia del Sacramento, Uruguay. 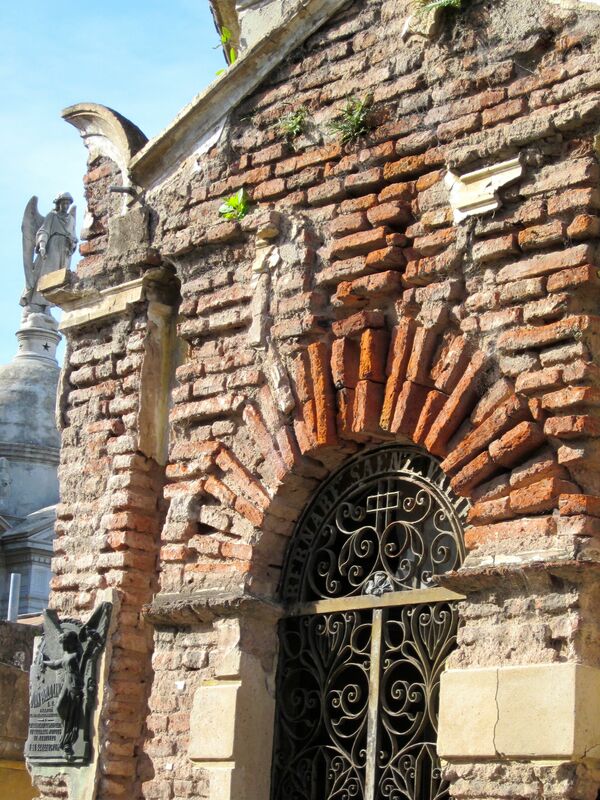 Colonia was founded by Portuguese settlers in 1680 on the coast of the Rio de Plata across from Buenos Aires. It is a picturesque town with famously photographed cobble stone streets, many small museums, a simple but beautiful cathedral, a bull fighting ring and a lighthouse. 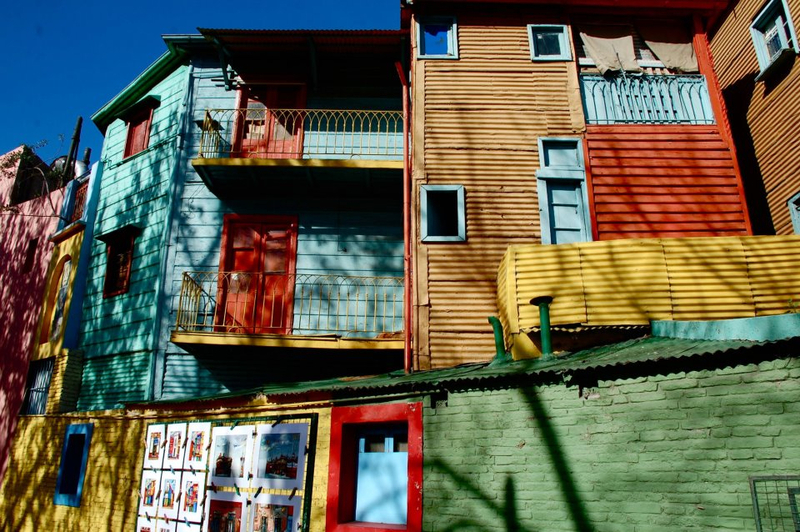 The Barrio Historica is a designated World Heritage site. 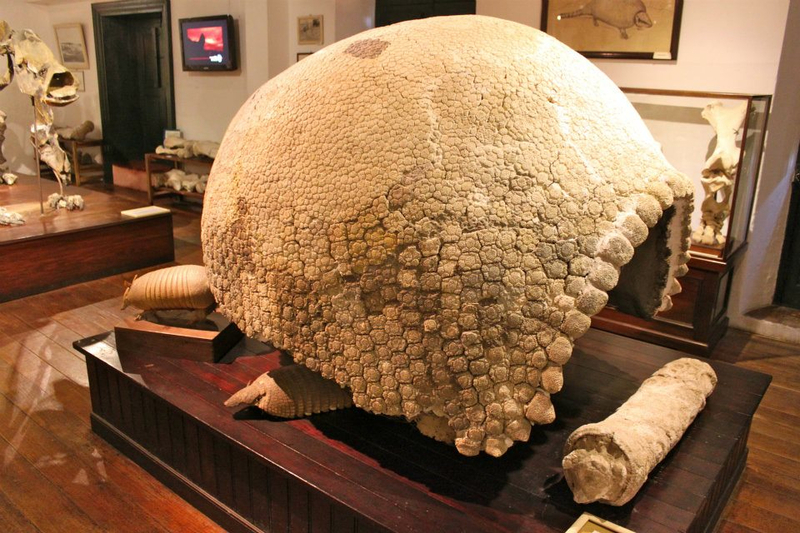 We spent three hours in Colonia exploring and enjoyed climbing to the top of the lighthouse to try to catch a view of BA and seeing the skeleton of GIANT armadillo-type creatures in the natural history museum. 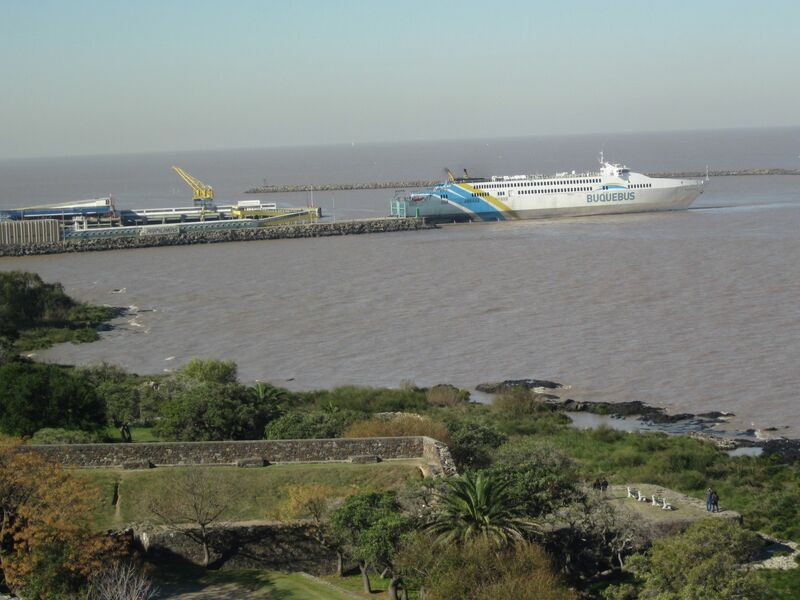 We boarded the Buquebus ferry in Colonia that took us to BA….it’s a huge ship and we had a very smooooth ride. 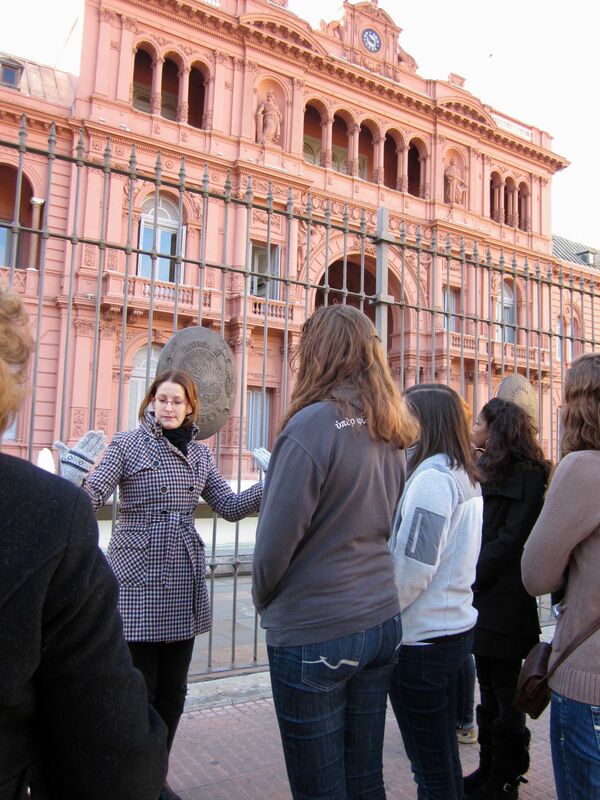 Saturday morning we took a tour of the city…our tour guide Angeles was energetic and did a wonderful job of giving us historical and political perspective as we saw important government buildings, the main cathedral, and then toured some of the well-known neighborhoods. 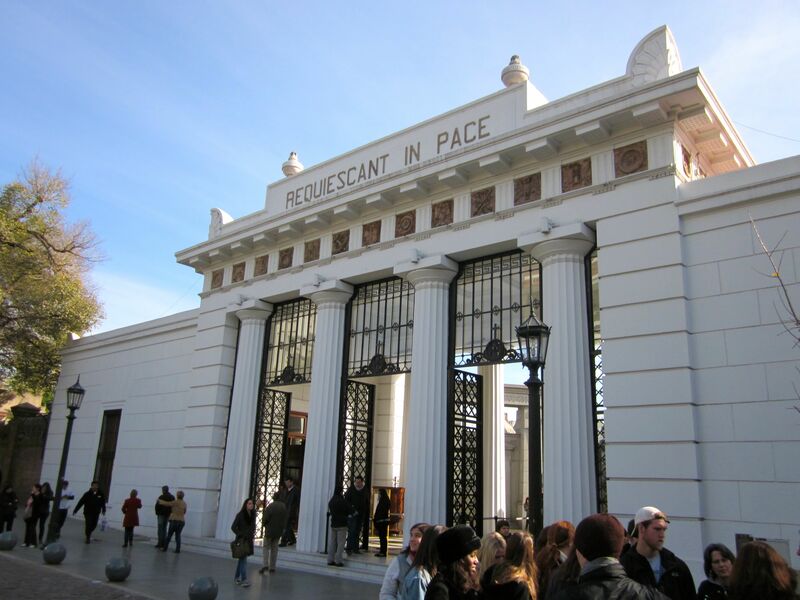 It’s sobering to realize that Argentina has only had a stable democracy for a brief 30 years…and Angles noted that there are many changes today that are worrying…like restrictions on travel and use of personal funds. It would take almost as long as the 5 hour tour to describe all of the interesting things we saw on Saturday, but enjoy the pictures below….we’ll be glad to fill you in, in person when we return! 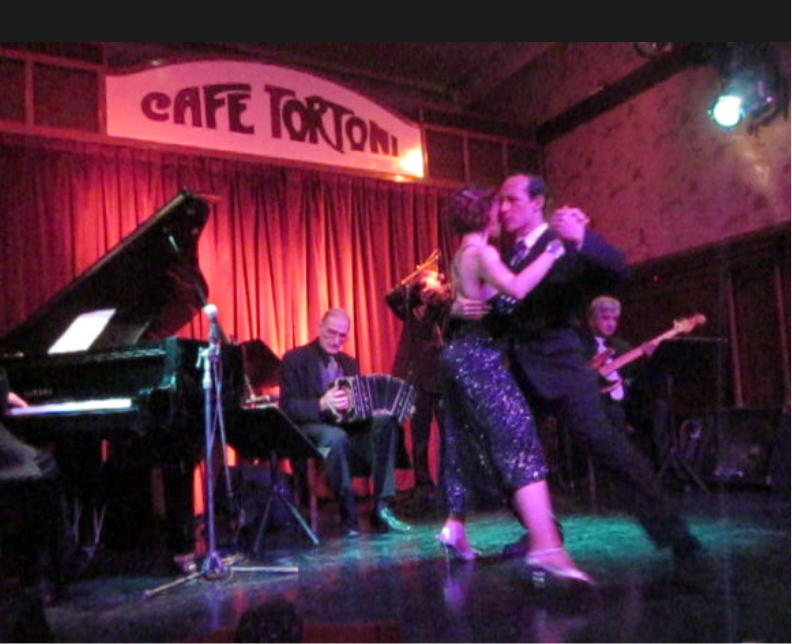 Saturday evening we attended a Tango show at the famous coffee shop called the Tortoni. It was a cultural experience…I would say a bit like old country music, with all of the intensity and passion…but Argentine style…and the dancing was definitely not two-stepping! 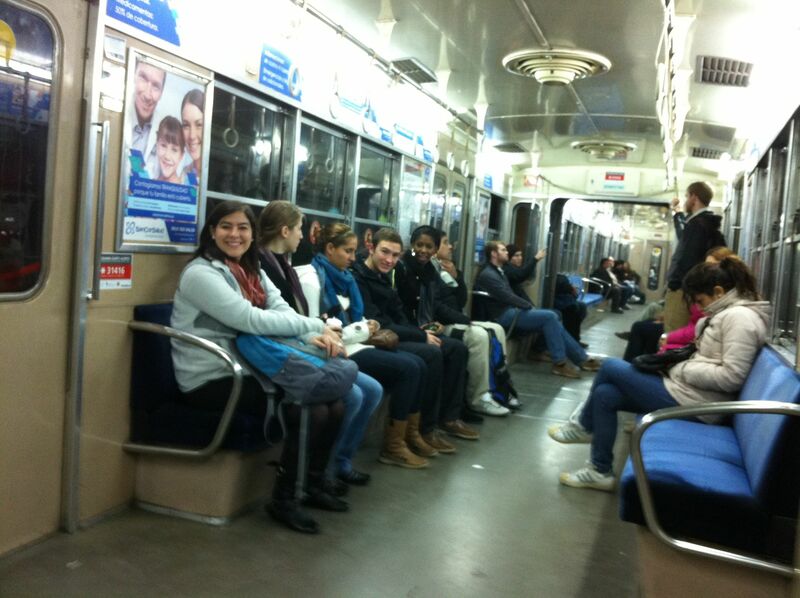 On Sunday, we rode the subway to church at the Caballito Church of Christ. This is warm and welcoming group of Christians and we enjoyed a bilingual service. 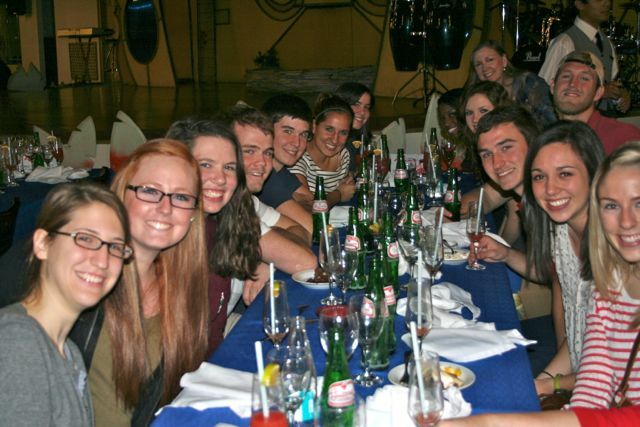 After the service the students went out to explore BA some more…and the faculty members stayed to participate in a church dinner…which lasted until 4 PM! 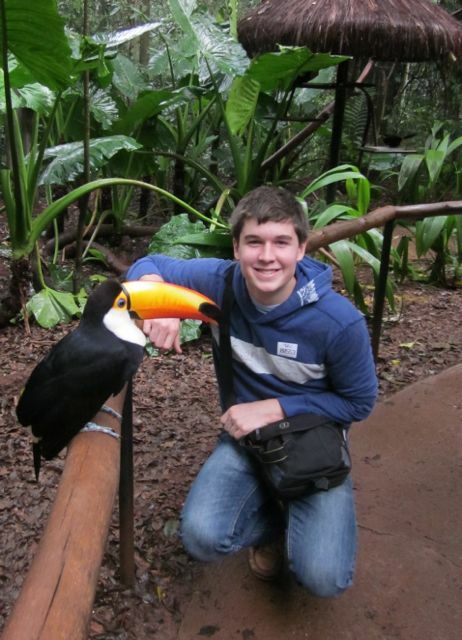 People just don’t hurry in South America…and seem to always have time to stop and talk and show their hospitality! 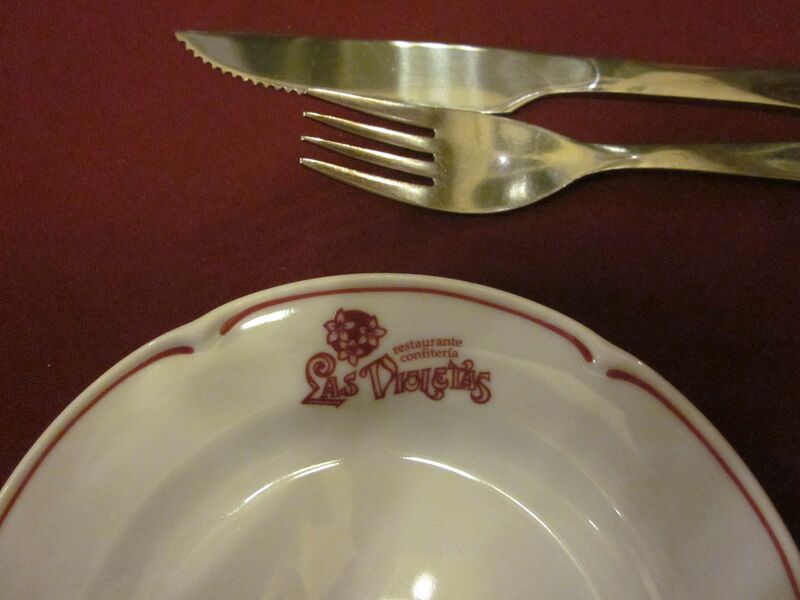 More time to enjoy ferrias in the streets…and then tea at Violeta’s…one of Lynette’s favorite places….if you look at the plates, you can see why! 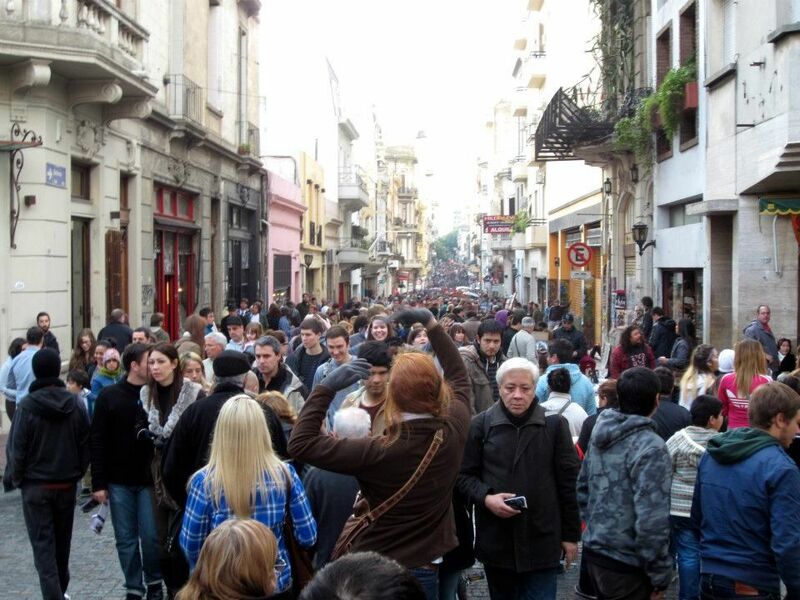 Our last day in BA….and it was full! 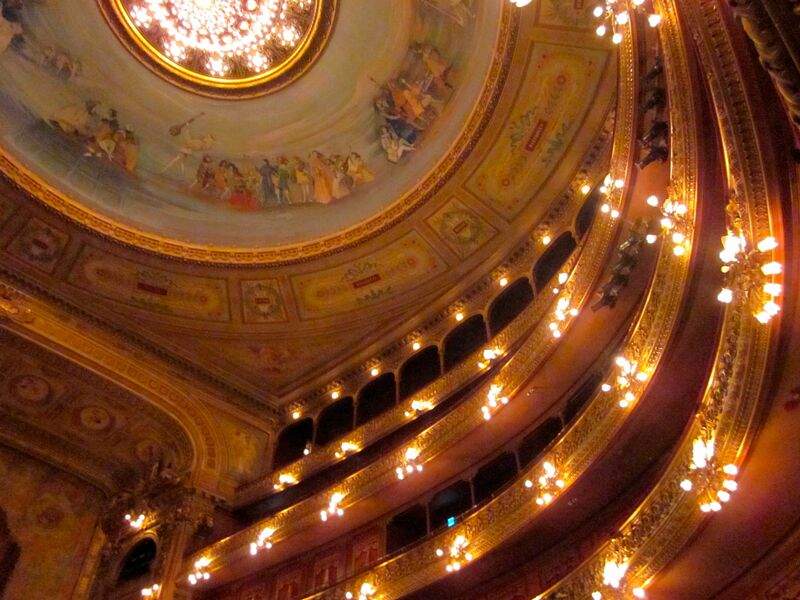 Groups chose to do different things, but Greg and I went on a tour of the Colon Opera house with a group. It’s beautiful. 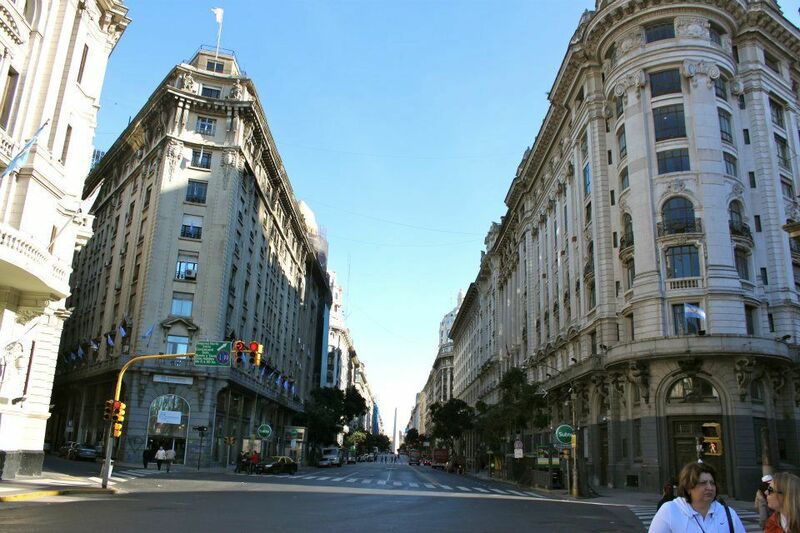 So sorry that there were no concerts planned during our time in BA! 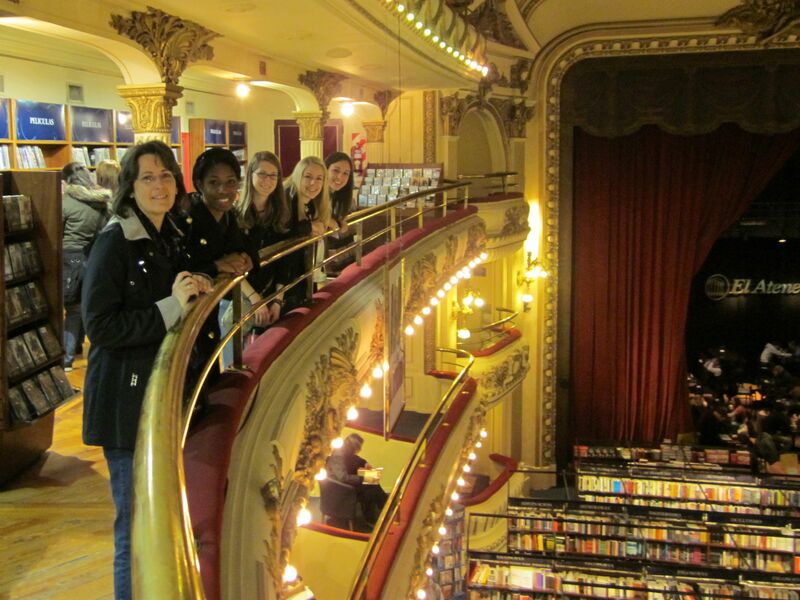 Next stop a bookstore in an old theatre…Barnes and Nobles should take note. And finally, we returned to the Recoleta neighborhood to spend more time in the cemetery…seems a little odd, I know, but this is one of the most amazing things I’ve seen…it’s a little city with street signs and an endless variety of ornate little shrines occupied by generations of family members. 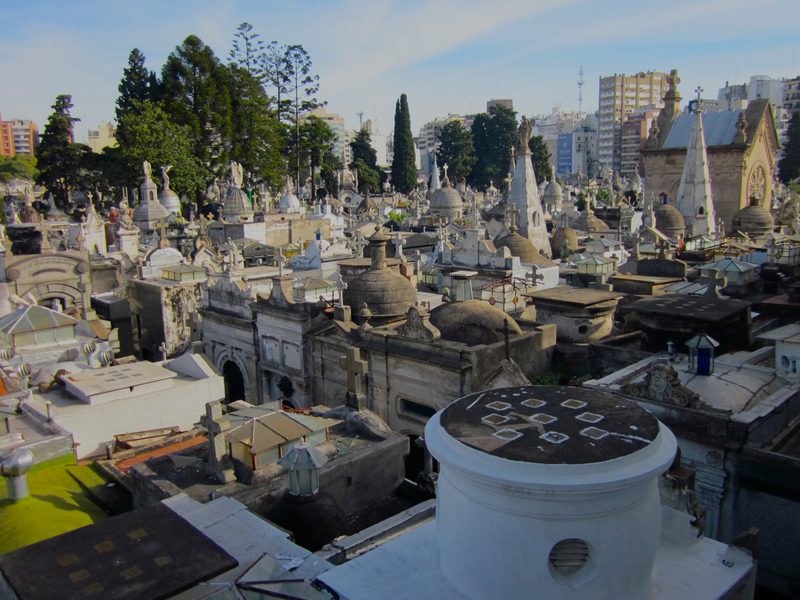 Famous graves include Eva Peron’s and several former presidents of the Republic of Argentina. 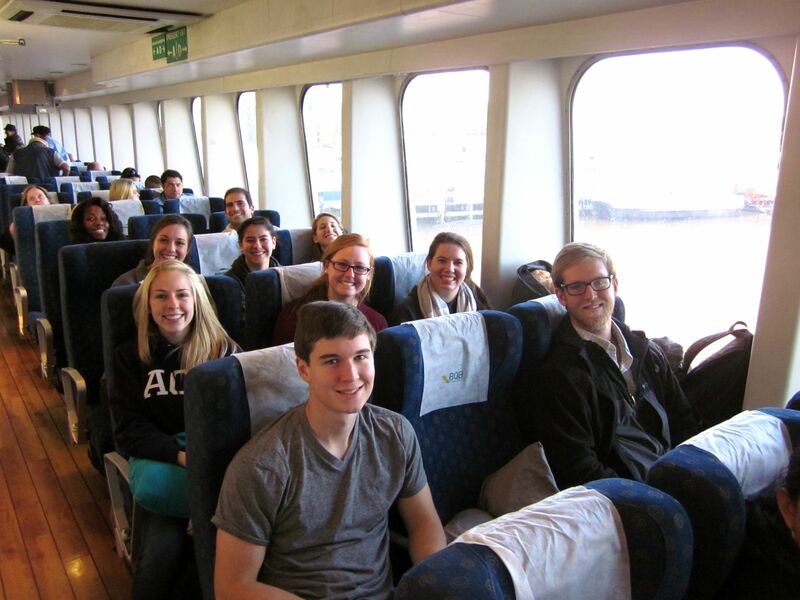 We returned to Montevideo Monday night after a return ride on the ferry and a 2.5 hour bus trip, very tired and not too motivated to return to the academic schedule. But classes started again bright and early this morning and I have to say that we have wonderful students who are very thoughtful about what they’re experiencing here and how it’s helping them think about politics, society, and how a country should/could provide for their citizens. 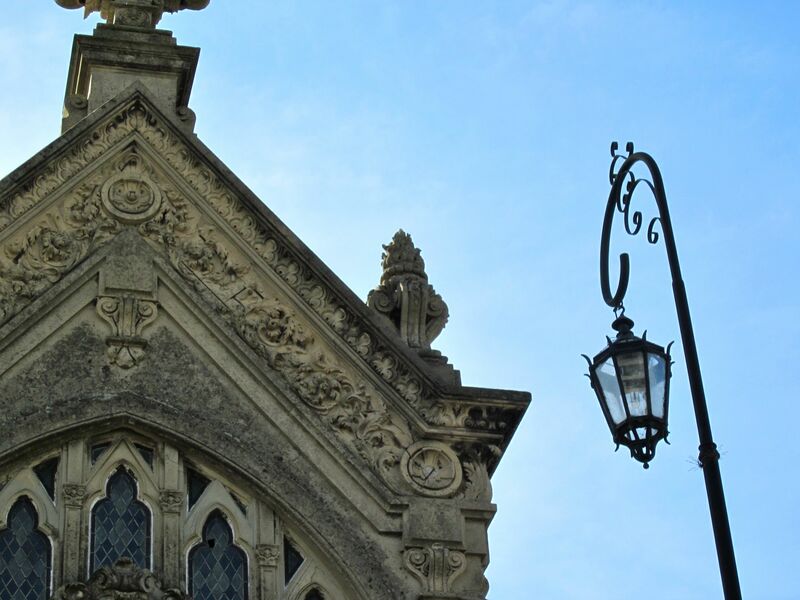 They’ve posted responses to their shadowing experiences on this blog….they’re worth reading! The cold air has settled over the city and we’re all growing accustomed to wearing three sweaters, a scarf or two and gloves when we go out! Despite the cold air, we’ve enjoyed a number of activities over the past few days….thankfully many indoors! On Monday 6/4 we had morning classes and enjoyed a guest lecture by a Christian physician who is Uruguayan of Armenian descent. Dr. Papatian spoke to us for about an hour about how his faith impacts the practice of medicine in Uruguay and why he chose medicine as a career. He encouraged all of us to think carefully about our motivations for each and every action and about how we will use our education to serve others. He used the example of Paul on the road to Damascus who responded to Jesus with two questions: (1) Who are you Lord? and (2) What would you have me do? I think that we were all very touched by his kindness and sincerity and by the stories he told of how he made choices early in his life that have affected how he lives and works today. He is an inspiration and we look forward to participating with him and other christian medical professionals and Uruguayan Christians in an outreach to homeless people in need of medical care through a mobile medical outreach called Projecto America. That evening we gathered in the student loft to watch a very intense movie called “The Official Story”. This movie won an Oscar for best foreign film in 1983. 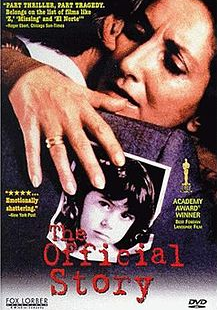 It’s the story of one Argentine family struggling with whether their adopted child was one of the appropriated children of the “disappeared” political prisoners…moving, sobering, disturbing…and an excellent history lesson before we travel to Buenos Aires next weekend. Tuesday 6/5 started with a trip to the port to get Yellow Fever shots. These immunizations are not absolutely required, but recommended for travelers to Brazil and that’s where we’re headed in just a few days! Class the rest of the day and lots of activity in the Casa kitchen that evening as students cooked dinner and then launched into a Harry Potter marathon….while doing homework….how do they do that? Wednesday 6/6. Every Wednesday students spend all morning in observation. 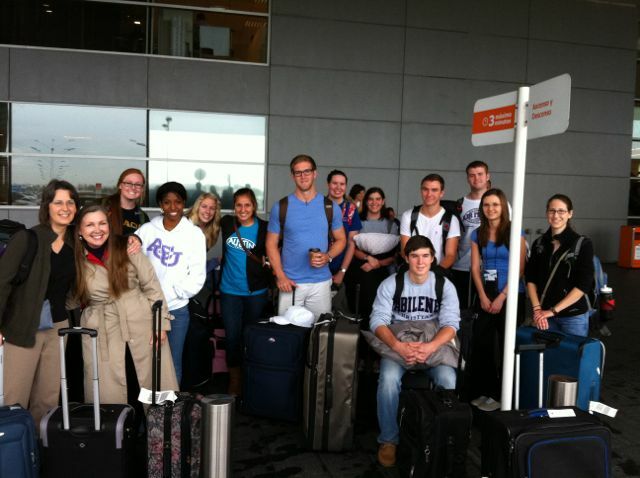 Nine students headed to Hospital de Clinicas and the four Speech Path students went to Escuela Roosevelt. They’ve had excellent experiences and I will ask them to post comments to this post that describe some of the interesting things they’ve seen and done. 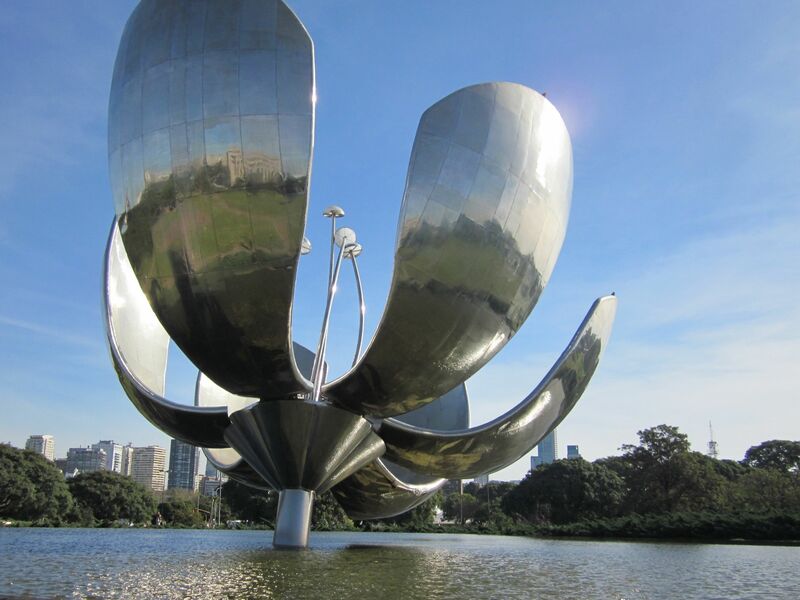 This afternoon we headed to the Uruguayan National Art Museum to see art painted by well known Uruguayan Artists and a display of unusual photographs of a man walking sideways up trees or buildings or sleeping on the ocean floor…all of this provided plenty of opportunity for the Core course students to talk about the sense of “identity” of individuals and community! Wimon Walker does a really good job of teaching his courses with a Latin American flavor and this allows the students to integrate all they’re seeing into what they’re doing in class. 5/23 Our anniversary! 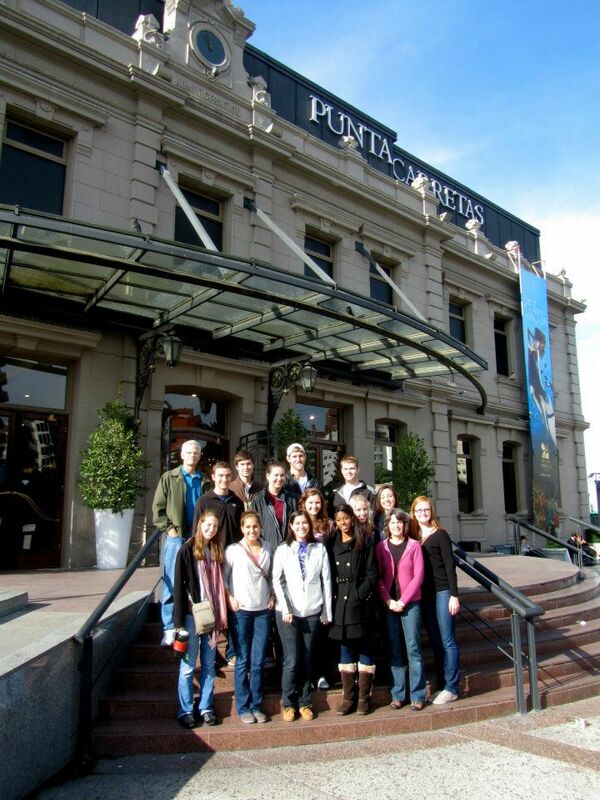 And we celebrated by doing Casa ACU orientation and then taking a tour of the cuidad vieja (the old city). This a beautiful part of the city with cobblestone streets and many walking streets and historic buildings. Later that evening we went to a very nice restaurant with the Walkers to celebrate a little more. I had wonderful fresh pasta….the Italian influence in this country is strong and the pasta is wonderful! 5/24 Our first Global Healthcare class meeting….we designed a healthcare system and talked about all of the essentials parts of any comprehensive system. 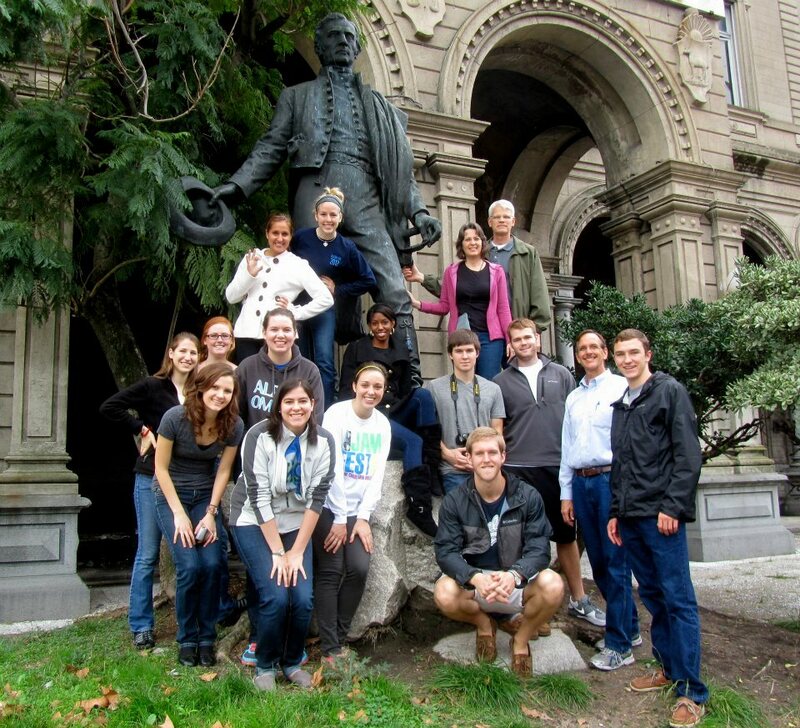 5/25 First meeting of the Core course and a bus tour of the city as a whole….still getting oriented! 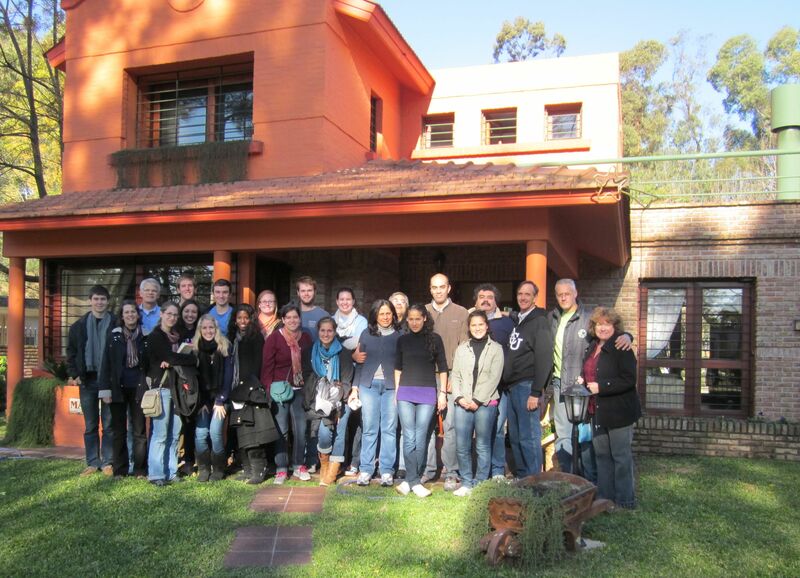 Then we toured the El Chana building that houses Casa ACU and the El Chana church. El Chana was a coffee company (eventually bought out by Nestle) The building has beautiful stained glass windows and from the roof (with a large clock tower) there is a spectacular view of the city. After our tour, youth from the El Chana church joined us to make pizza (recipe from Raquel!). We practiced our Spanish, culinary skills and made new friends! 5/26 We learned about the public bus system by taking the bus to Punta Carretes Shopping area….a very nice mall inside a building that used to be a prison. Outside the mall is a street market…the Villa Biantz Ferria. The weather was sunny and slightly cool and we enjoyed walking along the streets and looking at everything for sale! 5/27 Sunday…church at El Chana. We got lots of practice with traditional greetings and repeating our names. This is a warm and kind group of people. 9PM English worship in Casa. 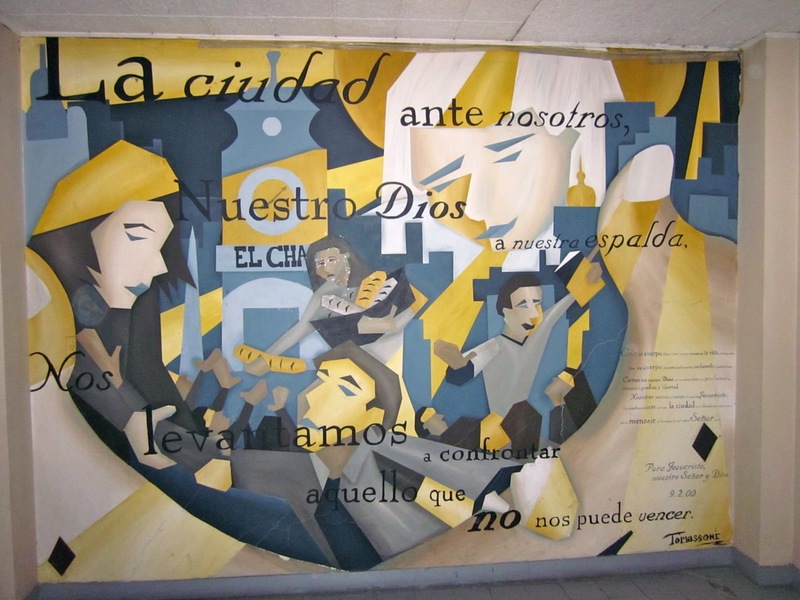 5/28 A long and eventful day….we had a 4 hour tour of Hospital de Clinicas with Dr. Perraza. He graciously took us through multiple wards and we visited the cardiology section, the transplant department and emergency areas, among many others. We were very tired, but saw a lot! Global Healthcare class all afternoon, and then Tango lessons during the evening! 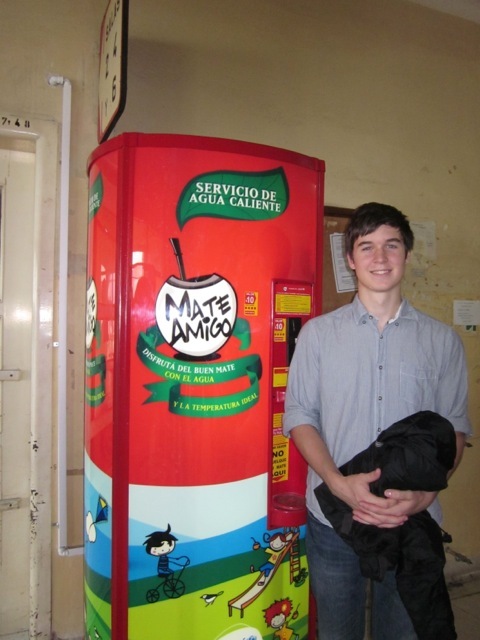 Mate (a type of tea) is the most popular drink in Uruguay. Here’s a machine in the hospital that can deliver more hot water in case you run out — something you’ll never see in the USA. 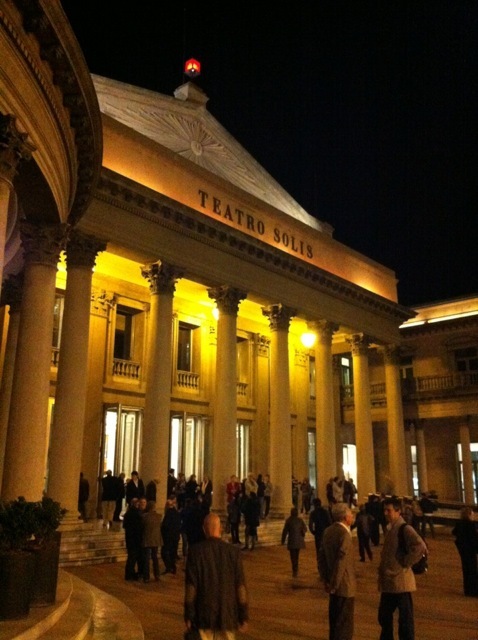 5/29 On Tuesday/Thursday we will usually have classes all day to allow the other days to be more open for outside activities….so Tuesday we had class and then that evening went to the beautiful theatre: Teatro Solis for a performance of Beethoven’s 9th symphony. It’s a spectacular venue and the music was wonderful. We had fun with Greg’s iPhone app that allows you to scan text in one language and attempt to translate to another….reading the program this way proved to be very entertaining! 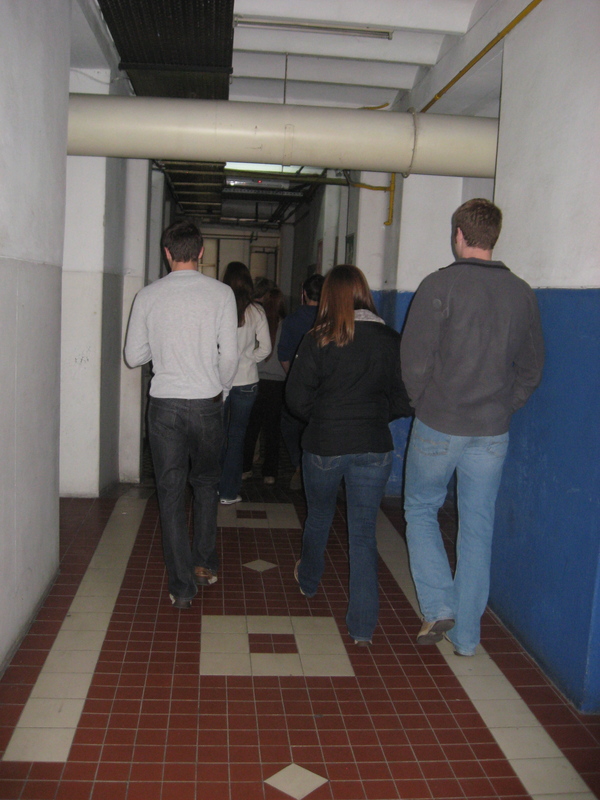 5/30 Pre-health students spent the morning in Hospital de Clinicas…observing. Several observed heart catheterization procedures, others did rounds with medical students. 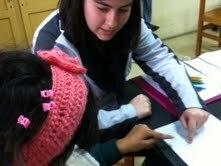 The speech path students went to Escuela Roosevelt…a school for disabled children and observed. Everyone came back excited about their experiences! And we spent the afternoon doing homework and taking care of household chores! 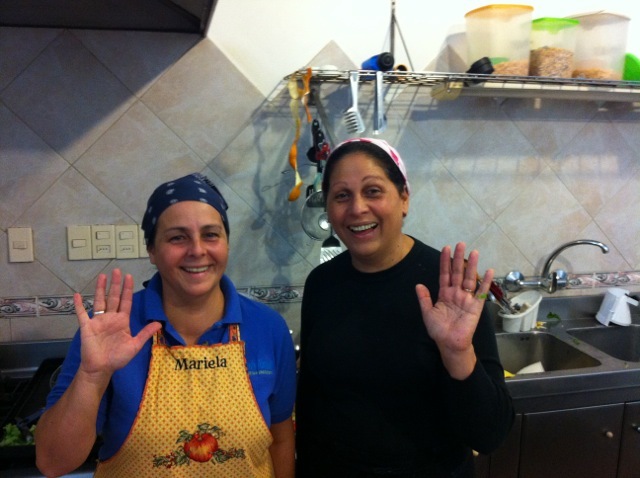 Mariella and Raquel are the wonderful cooks who regularly prepare delicious food for us at Casa ACU. 5/31 Class all day today, and a quiet evening….finally beginning to settle in to a routine! 6/1 Morning class for pre-health students. The speech path students toured the children’s hospital with local speech path students and really enjoyed their observation. Afternoon class for the speech path students, and the pre-health students toured the British Hospital…the nicest private hospital in Montevideo. Our host was Dr. Stanham and he was gracious and interesting and gave a very thorough overview of the Uruguayan Healthcare system! 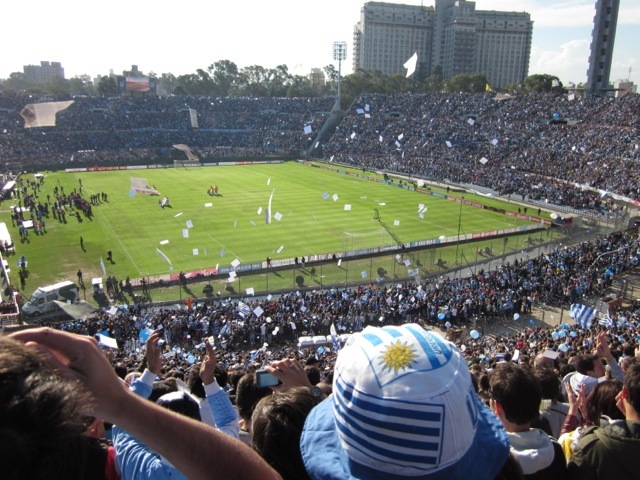 6/2 WORLD CUP SOCCER elimination game between Uruguay and Venezeula. 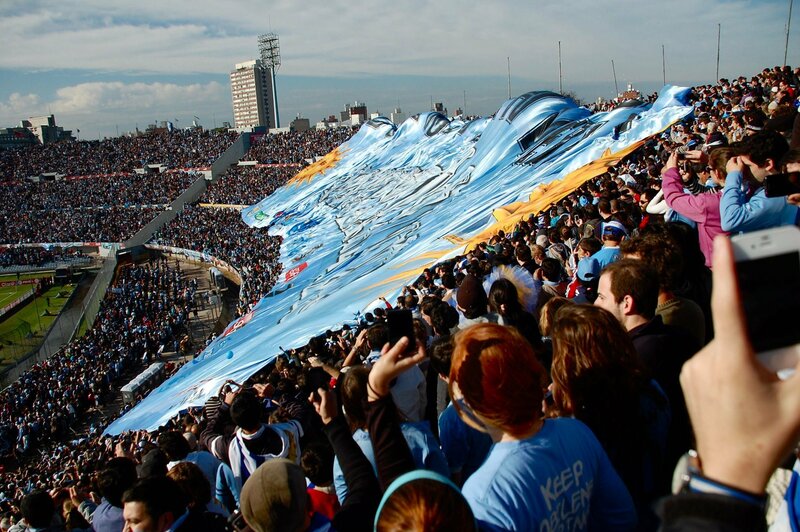 Uruguayans love futball! This was an amazing experience. Greg and I got to be part of the unfurling crew for the giant flag and we got to see Forlon score…..but the game ended in an unsatisfactory 1-1 tie. Ah well….they’re still in the hunt and playing well!!! 6/3 Our second Sunday in Montevideo. Church at El Chana…lunch at a lovely restaurant with the Walkers and then we rambled through a ferria. It’s gotten cold in the past few days….winter has arrived! That’s what we’ve done so far. We’re learning a little Spanish and it has been much easier to fall into a working pace since this is a return trip and so many of the little basics are familiar. Hope all is well wherever you are in the world…and that you are aware of God’s presence and constant love and mercy.